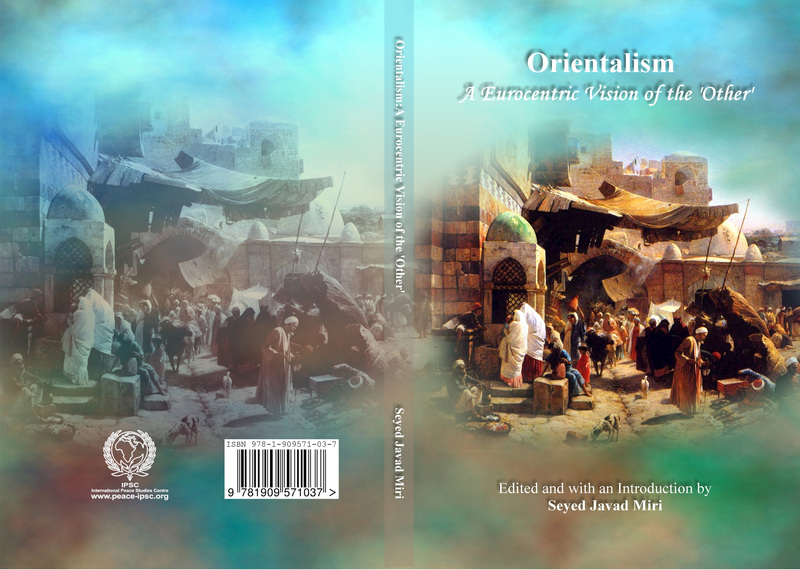 In this book, the authors have argued that Orientalism is a eurocentric vision of the ‘other’. The question of Orientalism has been treated in this work through different angles such as sociology, film studies, literature, philosophy and cultural studies. The book is a joint project by 8 authors at distinguished universities and institutes from US, UK, Singapore, France and Iran. The director of the project is Dr. Seyed Javad Miri who is an associate professor at the Institute of Humanities and Cultural Studies in Tehran, Iran. To purchase a copy of the book please send a check for £40 (£30 book cost + £10 post and package) for the International Peace Studies Centre to “Unit 121, IPSC, 268 Belsize Rd, London, NW6 4BT, UK” and send an email to director@peace-ipsc.org indicating the number of copies required, your name and address and confirming the check being sent. apparently closer to Orientology which does not exist within western academic circles but even this seemingly innocent branch of academic knowledge in Russia is based on erroneous assumptions. These questions and many other queries during this trip compelled me to think over this problem as an offshoot of Eurocentric vision of the world which has overshadowed various domains of social sciences and humanities. In addition, I realized that non-Eurocentric approaches to cross-cultural studies have not reached Russia and Russian social thinkers have not realized that Russia has been a colonial power and Tatars should realize that they are in dire need of post-colonial theories for dis-covering their locus in the scheme of global affairs rather than talking about orientology a la Europeans and Russians in the 19th and 20th centuries. … the basic concept, is that . . . historically, through literature and art, the ‘East,’ as seen through a Western lens, becomes distorted and degraded so that anything ‘other’ than what we Westerners recognize as familiar is not just exotic, mysterious, and sensual but also inherently inferior (Said quoted by Najla Said, 2013). political, and diplomatic issues but in psychological sense of being. In other words, sometimes we cannot reach each other due to our mental images of the other and orientalism as a discourse has contributed to this sense of misunderstanding by breeding an unrealistic sense of superiority in the western mind which has meant, like all kinds of binary oppositions, an imaginary sense of inferiority in the oriental mind. In these discursive ideological battles the gentle voice of humanity has been lost by racists who categorized human societies in accordance to misconceived so-called scientific categories which gave them right to dominate the ‘others’ around the globe. Of course, today we are in a better position as people have become more conscious about each other and their respective limits and possibilities but we should realize that ignorance is more dangerous than all kinds of weapons of mass-destruction and the key to harness ignorance in all its fashions and modes is intellect. In other words, we need to engage with each other more and realize that our humanity is actualized in relationality and this interdependency is not only true on individual levels but on communal as well as global levels. To put it otherwise, peace is not possible if we do not realize that humanity is conceivable as a category when relationship is established between all members of human family on authentic basis. This is to argue that it is high time to realize that we may be on different level of social progress around the globe but socioeconomic advances do not automatically issue for us a license to coerce others to be what we want them to be. Because being is an act of choice and the true quality of human society is appraised in accordance to the level of realization of choice both individually and institutionally. Once we forget these basic rules of being then we lose the art of being and cannot achieve the art of living in the memorable words of Erich Fromm. In sum, we all need to have certain norms when studying the other but this does not qualify us to impose our normative vision of reality to others without realizing that reality could be more complex than our conceptual frame of references. This is something that I could not make my colleagues at the VIII Congress of Russian Orientalists in Kazan to realize. Although concepts capture for us complex gamut of reality in an intellectual fashion but they cannot reflect all dimensions of reality in an all-comprehensive fashion. If one does not realize this fact then the existential consequences of this remiss would be grave and catastrophic.